The shank end of the drill bit is the end by which the bit is held and driven. 3-Flatted Shank - Generally 3 flats designed to allow a strong chuck grip on the shank. Reduces the possibility of the drill slipping in the chuck during tough drill applications. Reduced Shank - Usually 1/4", 3/8", or 1/2" and are designed to allow a larger diameter drill to be used with a chuck capable of holding only smaller diameter drills. Tanged Shank - This style of shank is used with a split sleeve drill driver as a replacement for taper shank drills. 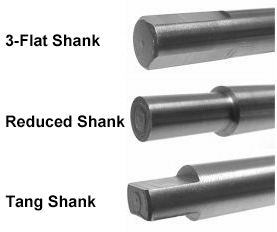 Shank — The part of a drill by which it is held and driven. Washout — The extreme increase at the end of the flute, formed by the grinding wheel or cutter. Web Increase — The web thickness increases in thickness towards the shank to enhance the rigidity of the drill. The drill body is that portion of the drill that extends from the shank to outer corners of the cutting lips. Drill Body — Portion of the drill extending from the end of the flutes to the outer corner of the cutting lips. Drill Axis — Imaginary straight line that forms the center line of the drill. Back Taper — Slight decrease in diameter from point towards shank, in the body of the drill. 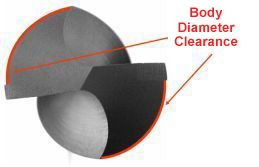 Body Diameter Clearance — The portion of the land that has been cut away so it will not bind against the walls of the hole. Neck — The section of reduced diameter between the body and the shank of a drill. Flute Length — The length from the outer corner of the cutting lips at the point (shoulder) to the extreme back end of the flutes. Example Measurement: 2-11/16"
Flutes —Grooves formed in the body of the drill to provide cutting lips, to permit removal of chips, and to allow cutting fluid to reach the cutting lips. Out-of-Round — Not round. 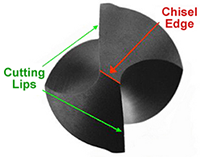 If caused from centerless grinding, the part will usually have 3 lobes. Overall Length — The length from the extreme end of the shank to the extreme end of the drill point. Drilling today's wide variety of materials efficiently requires a great variety of drill points, types of web thinning and drill design. The proper use of controlled drill pointing and web thinning can result in substantial savings in drilling cost. 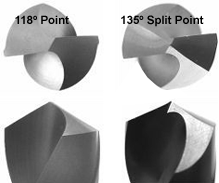 Point 118° and Split Point 135° — Split point self centering, requires less thrust in drilling harder metal, breaks up chips. Point — The cone shaped cutting end of a drill, made from the ends of the land and web. Cleared Diameter —is measured using a micrometer over the diameter of the cut away portion of the drill lands. Cutting Lip — The cutting edge of a two-flute drill which extends from the chisel edge to the outer edge. Secondary Cutting Edge — The cutting edge formed by the intersection of the face of the notch with the relieved surface of the point, resulting in partial removal of the chisel edge. Drill Diameter — The diameter over the margins of the drill measured at the point. Land — The outer portion of the body between two adjacent flutes. Lip Relief Angle — The relief angle at the outer corner of the lip. Margin — The narrow portion of the land which is not cut away to provide clearance. It stabilizes the drill in the hole. Web Thickness — is measured by using a point micrometer positioned at the point end. Web — The central portion of the body that joins the lands. The extreme end of the web forms the chisel edge on a two-flute drill.